Sick of chasing so called 'easy money' and just want to know the things REAL internet marketers do? 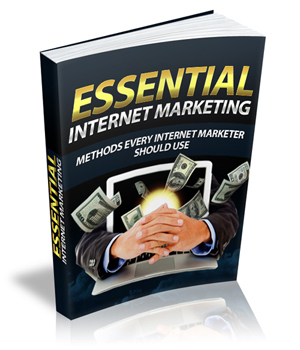 "Discover The Things That EVERY Internet Marketer Should Be Doing - and Find Out How To Do Them... So That You Can Build a Real and Successful Online Business"
It's the old tried and tested things such as building your list, creating information products, building membership sites... and such like. If you concentrate on those things then you should start to see some success online. Heard people talking about the importance of list building but don't have a clue how to go about it? Want your own product but don't know how to create one? Think of it as a crash course on some of the essential elements of internet marketing. I can't guarantee your success of course but I DO believe hand on heart that if you use the strategies I outline in 'Essential Internet Marketing' then you're much more likely to succeed online than if you spend all your time chasing gold and going after the latest fancy, glitzy techniques. P.S. If you've ever wondered what makes up the income of most real-life marketers then this is the answer.